Police have confirmed a 33-year-old woman arrested in Banbridge as part of the James McDonagh murder investigation is herself a PSNI officer. Arrested on Saturday morning and reportedly questioned about witholding information “as part of the overall investigation”, she was later released on police bail. James ‘Jim’ McDonagh (28), from Castledawson, died in hospital as a result of head injuries sustained in an incident outside the Elk Bar in Toomebridge in the early hours of Sunday, January 10. He came from a travelling background and was married with two young sons. Toomebridge man Finbar McCoy (24), from Loughbeg Road, has been charged with his murder; he denies the charge. A court heard the cause of death was a blow to the back of the head, possibly caused by Mr McDonagh falling backwards after he had been punched in the face. 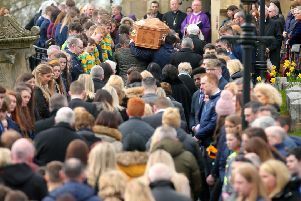 At Mr McDonagh’s funeral in Coalisland on Sunday past Father Paul Byrne told the congregation the young man’s life had ended too soon. During the Requiem Mass Fr Byrne called for no revenge.